The obsession with appearance and attractiveness, not dissimilar to an animal’s preening to lure a mate, is a permanent fixture in today’s glossy society. Skillfully cropped and obliquely angled, Craig-Martin’s work rarely allows for the identification of her subject’s face, subverting the concept of society party pictures, by highlighting the opulent baubles, plumage and telling details which offer commentary of society’s obsession with surface. Frazier’s photography offers a similar approach in regards to the Western rodeo ideal of the “American” beauty. Frazier’s Rodeo Queens wear tight, glittering red, white and blue spandex with giant gold belt buckles and sport sky high, expertly coiffed permed hair. The third-person focus on oneself as an alluring “character” is portrayed in the finely painted portraiture of O’Donnell and lenticular photography of Walter. 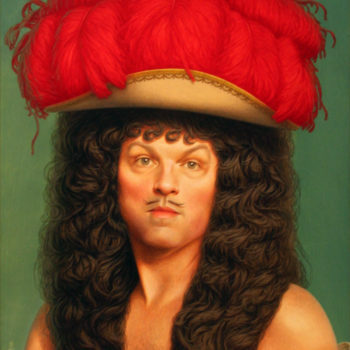 O’Donnell’s theatrical self-portraits capture the splendor of 18th Century French Court, as he experiments with aspects of his personality – both in male and female dress. Walter reveals a slightly different materialistic focus in her work. Included in the show is the piece Vacay, which is a photo composition of an over-indulgent ladies weekend, with all of the accoutrements one would expect: skimpy designer bathing suits, high heels, tropical drinks and a shirtless tanned waiter with six-pack abs. For more information, contact Megan Des Jardins at (206) 652 5855.